The 60mm f2.8 macro lens comes equipped with a supersonic actuator for fast, silent and precise auto focusing perfect for capturing an amazing image of a fluttering butterfly. Thanks to its internal focusing system, the lens barrel remains fixed so you can get right up close to your tiny little subjects without startling them and capture stunning details that can’t be seen with the naked eye. The intuitive i-Function feature gives users one-touch access to all your camera's manual settings. Adjust the aperture, shutter speed and more with just a twist of the lens while previewing the image in real-time. The lens also comes equipped with lens-shift optical image stabilization to cancel out motion blur for clear, sharp images. 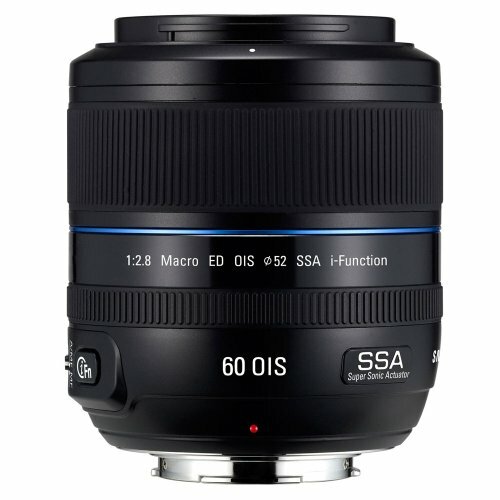 This 60mm f2.8 macro lens is compatible with all Samsung NX Compact System Cameras. Optical image stabilization which cancels out motion blur for crisp, clear pictures- even in low light.